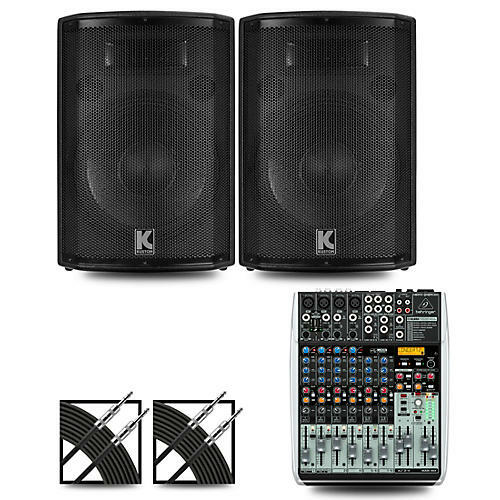 These convenient live sound packages make it easy to get started quickly so you can spend more time rocking the party and less time researching what gear to buy. We’ve done all the work for you and hand-selected the components for optimum performance and value. No matter which package you choose, you can count on high-tech features, reliable components and powerful, premium audio that will let you sound your best, gig after gig. The compact QX1204USB mixer allows you to effortlessly achieve premium- quality sound, thanks to its 4 onboard studio-grade XENYX Mic Preamps and ultra-musical British channel EQs. And Behringer's easy-to-use one-knob compressors provide total dynamic control for the ultimate in punch and clarity, while respecting all the power and emotion you pack into every note. Add to this the sweet sound of British-style EQs and a KLARK TEKNIK Multi-FX processor with LCD display, dual-parameters, tap function and storable user parameter settings, and the QX1204USB becomes an incredibly versatile mixer for your live performances resources. Powered by Kustom’s proprietary Class D amplifier, this high-performance audio cabinet delivers unmatched performance in a lightweight, portable form factor. The amplifier features Dynamic Clip Thresholding limiter that continuously monitors the available headroom and gain to provide the maximum level of undistorted power. The cabinet is tuned for optimized low-frequency response and punchy mid-range presence. The low-frequency driver delivers high sound pressure levels and is punctuated by the upper frequencies delivered by the neodymium compression driver.